Yosemite is alive and kicking in the Spring, so we did a little road trip. One day, after kayaking the Merced River, we decided to jam up to Yosemite Valley to do a quick evening hike at Yosemite Falls. 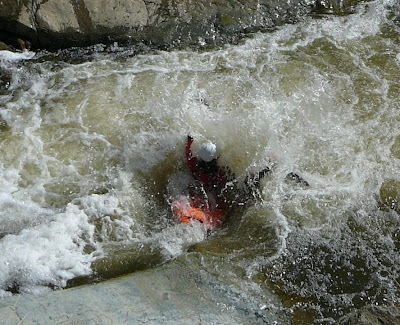 Here's a shot of Dave on the Merced - notice that he forgot his drytop. Brrrrr. I wasn't any better at remembering things, and realized (once at we were at the trailhead) that i had lost my shoes somewhere back at the river. So i had to hike in flip-flops. To avoid all the crowds on this classic hike, start in the evening with about 2 1/2 hours of daylight left! You'll pass only a few stragglers - and hopefully you'll elude the captain-safety-know-it-all hiker dressed head to tow in brand new REI techy gear, who cant resist giving you the scolding glance for starting the hike so late. Or maybe it was the flip flops? The hike is about 7.2 miles round-trip with 2,700 feet elevation gain. Its not too long, but certainly steep. I highly recommend hiking shoes. This is what the National Park says: "One of Yosemite oldest historic trails (built 1873 to 1877), the Yosemite Falls Trail leads to the top of North America’s tallest waterfall 2,425 feet (739 m) above the Valley floor. Do not stray off the marked path, as you will find steep drops adjacent to the trail. Enjoy spectacular views..."
Here's the webcam to check conditions before going. Every winter and spring, we see this contagious stoke, this perma-grin, apparent on all the faces that come back from Brush Creek outside of Kernville. Finally Dave couldn't take it anymore, he had to go check it out. Thanks to Geno, who showed him all the lines, he got the most air time of his life! He couldn't really articulate the intensity of the experience... just all this stuff about "the ultimate freeride park" and something about "paddling up to the edge of an infinity pool and seeing the earth drop out before you..." He's got the Brush Creek fever. Thats Dave and Geno peeking over the top of the Triple Drops. For some perspective, check out the picture below. Its the same picture...just zoomed out. You can just barely see them (the size of dots) at the very top of the rapids. The scenery was magnificent, even though its the middle of winter. Brush Creek is considered a classic in the boating world, and often called a "freak of nature." 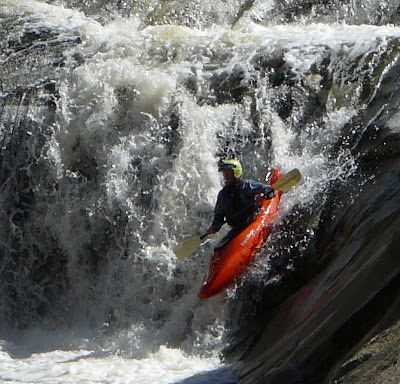 Even though its a steep narrow creek and there are nonstop drops and waterfalls, it is relatively safe for this type of kayaking. Looking at the White Mountains above Bishop. Skiing down to Hot Creek. Nobody else to be seen for miles! Ahh, the rewards of skiing in a storm. Heading toward Mt Morrison on our way back. Here's a GPX file of our route to Hot Creek (it also includes a 5 mile cross country ski loop at Shady Rest). Snowshoeing above the Unal Trail near the small ski resort Alta Sierra/Shirley Meadows in the Greenhorns (about 8 miles above Isabella Lake) leads to some pristine powder in a cedar forest. While we often find ourselves searching for fresh tracks in the Eastern Sierra near Mammoth, we're expanding our range and discovering an amazing gem of powder and beauty: the high country of the Sequoia National Forest! Near the Unal Trail, the Portuguese pass Road becomes a groomed x-country ski/snowmobile route with incredibly vast views of the Kern River Valley. Maps of groomed trails and x-country ski/snowmobile routes are here. But for even deeper powder and higher elevation, we recently checked out Sherman Pass. (Here's the area in the summer.) Some of us snowshoed up the partially groomed road, while others telemarked. Carvin' up one of the many ski bowls on the way back down. Across the Kern River is another spot we've enjoyed x-county skiing; its near Ponderosa (past Johnsondale) and the Trail of 100 Giants. Check out this giant sequoia...you can ski through it! 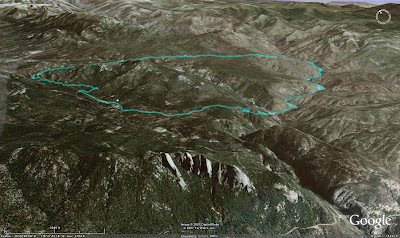 This 26 mile loop made a wonderful 3-day backpack trip in the Golden Trout Wilderness of the Southern Sierra. We hiked from the Jerkey Meadows Creek above Lloyd Meadow Creek to Little Kern River, up and over to Kern Flat, and down the Kern River to the Forks of the Kern. The graphic above shows the Needles in the middle foreground with the Kern River in the gorge to the right, and the Little Kern Drainage in the middle. 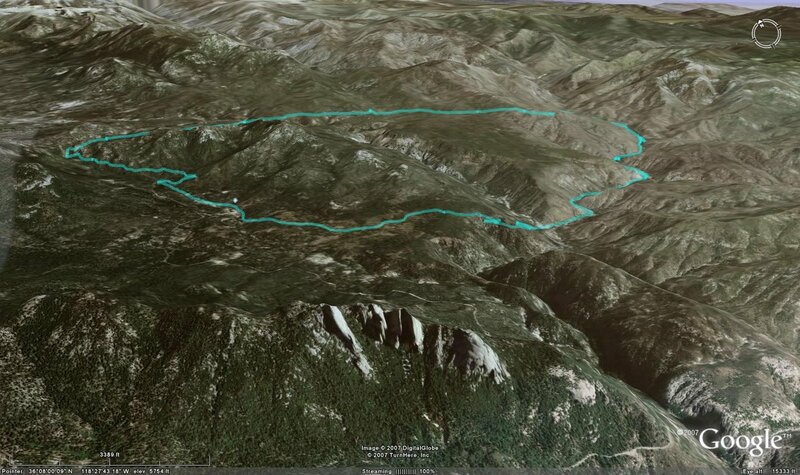 The blue line is our backpacking route, with Kern Flat being at the top right. The Forks of the Kern (the put-in for one of the most epic wilderness kayak/rafting runs in the US) is at the lower right of the loop. Here's the GPX file of the trip. The first day, we hiked 5 miles up to Jerkey Meadows and down to the Little Kern River. The granite bedrock gorge was filled with wonderful swimming pools and small waterfalls. It also happened to be one of the best fly fishing creeks I've ever been too. I bought a specific Little Kern Fly from Kern River Fly Fishing, and literally caught a beautiful Golden Trout on every cast. There was no one around, and we set up camp on a secluded pool in comfy pristine sand! Since it was only 5 miles in and a relatively easy hike, we had time to swim, fish, and explore the area. Because it was late in the season, the water level was low and fairly warm. There was no need for backpacker food - we ate fresh fish for dinner! Here's a photo of the Little Kern just below the trailhead. 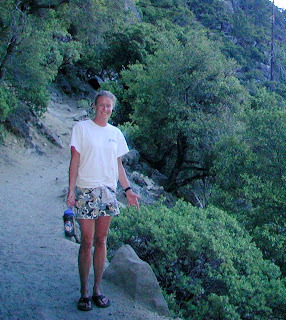 On the second day, we hiked up and over a pass on our way to the Kern River. We passed Flat Iron, several meadows and springs, and then made the long descent through the burnt-out Doe Meadow on our way to Kern Flat. Wildlife tracks were everywhere - there certainly seems to be a healthy supply of bear, coyotes, and deer. The Kern River is absolutely beautiful in this area! We hiked a little ways south along the river and found a nice campspot near some excellent fishing and swimming holes. Once again, the fishing was world class with unique Golden-Rainbow hybrids...and they were big!! We spent most of the 3rd day fishing and hiking all along the river - about a 12.5 mile hike. About 7 miles down, we reached the Forks of the Kern, where the Little Kern meets the North Fork. Here, we passed several day hikers and rafters getting ready for a super low flow 4-day trip down the Kern River to the Johnsondale bridge. The remaining portion of our trip took us uphill from the Forks, and back to the trailhead. We cant wait to return and explore more of the area. 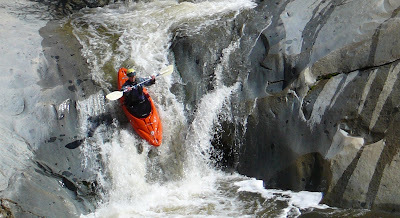 Hiking/climbing down the Little Kern Drainage and kayaking these upper sections of the Kern River are now on our list of things to do!